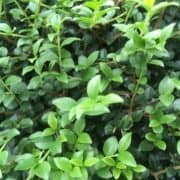 Ligustrum delavayanum: A compact evergreen shrub with ovate, dark green leaves and short panicles of small white flowers in early summer, followed by blue-black berries. Buxus Cloud: Box. 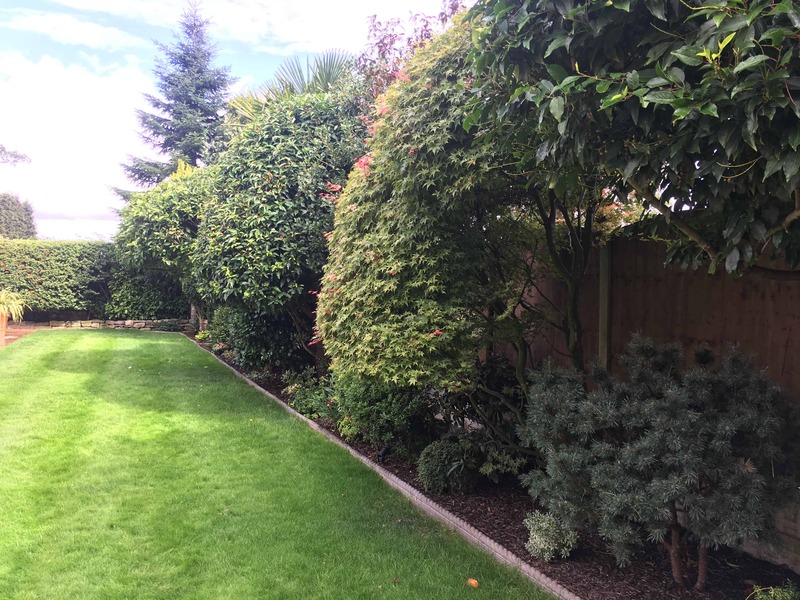 Trimmed to perfection! Carpinus Umbrella: Hornbeam. 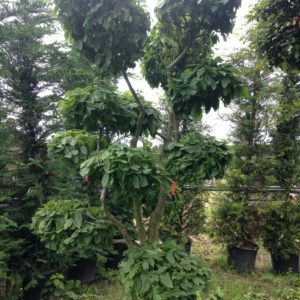 A unique, mature, umbrella shaped specimen. 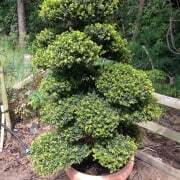 Ilex Crenata Cloud: Japanese Holly. Beautifully hardy, skillfully trimmed as cloud plants. 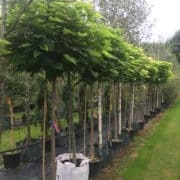 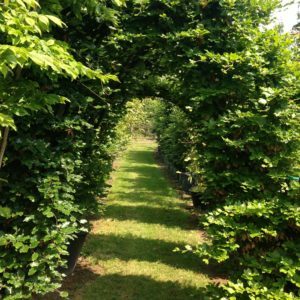 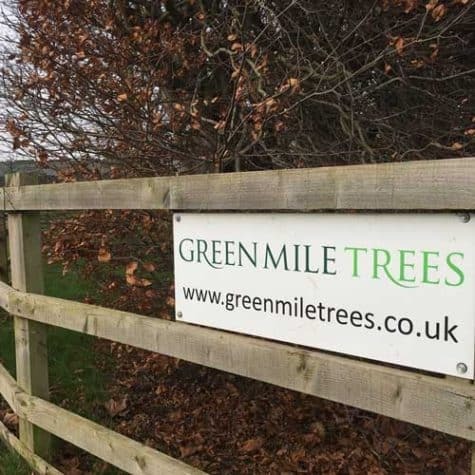 Tree Arches: Beech and Fruit tree arches available. 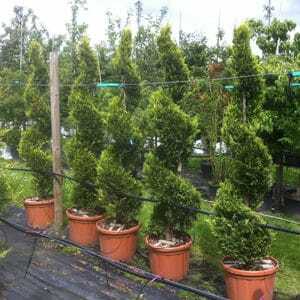 Topiary Pines: Various shapes and cloud pruned pines. 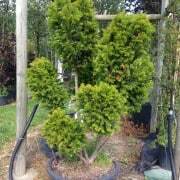 Taxus cloud: Taxus baccata. 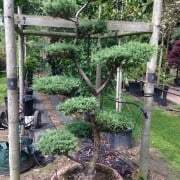 Some wonderful cloud pruned Taxus and Golden Taxus, as well as umbrella forms. 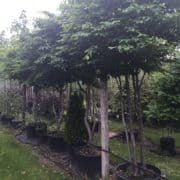 Carpinus cloud: Carpinus betulus – Hornbeam: Great leaf structure and growth and perfect for clipping. 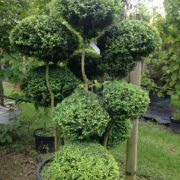 We have some beautifully trimmed cloud plants and umbrella forms. Clipped to add a formal stylish touch to any garden, the hard work has already been done with these plants. A light trim every few weeks will keep these in good shape. 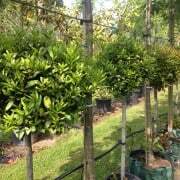 They do well in a large container. Laurus nobilis: Bay laurel. A medium to large evergreen shrub or small tree, with a dense habit. 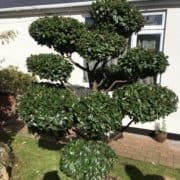 It takes well to close clipping. The deep green leaves are aromatic when crushed. Tiny white flowers are carried in spring.